Magnetic properties of rocks can be useful for determining paleoenvironmental changes. A dramatic climate change that occurred in the Paleocene-Eocene Thermal Maximum (PETM) modified the environment and, hence, the magnetic properties recorded in the sediments. New paleomagnetic data from marine records of the PETM in the Southern Pyrenean zone displays a variation of the magnetic parameters in four different sections. The magnetic signal reveals a positive excursion of magnetic values starting before the onset of the marly interval of La Faja de las Flores Mb (beginning of the PETM record, Ilerdian) in the Carriata section with a maximum value in the marly interval. A similar magnetic signal is observed in the Bujaruelo section (~10 km south of Carriata at PETM times) that is related directly to the marly interval of Faja de las Flores Mb. However, towards the south, the PETM interval does not appear in the sedimentary record; therefore, in the southern Gallisué section, no magnetic excursion occurs. In the southernmost-studied Entremón section, a positive magnetic excursion occurs in a thin marly interval unrelated to the PETM, and in two lower intervals of the column. All sections were later subjected to deformation during the pyrean orogeny and the three northernmost sections in the regional cleavage front, where pressure solution and remagnetizations have been described. A post-folding remagnetization component is found in the three northern sections. The Paleocene-Eocene Thermal Maximum (PETM) has drawn the attention of investigators on global change over the last decades as it represents a good ~56 Ma ago analog to the present-day dramatic warming related to massive carbon release into the ocean-atmosphere system (Kennett and Stott, 1991; Dickens, 1999; Norris and Röhl, 1999; Bowen et al., 2006; McInerney and Wing, 2011). The PETM involved a rapid increase of 4–10°C of the Earth's surface temperature (Zachos et al., 2008), and it is associated with the sedimentary record with a negative δ13C excursion in both marine and terrestrial organic matter and carbonate as a result of the massive influx of the light carbon isotope (Kennett and Stott, 1991; Koch et al., 1992; Luterbacher et al., 2000). A subtle excursion in δ13C and δ18O has been found to the east and west of the studied area (Pujalte et al., 2003, 2009); however, no clear data from stable isotopes have been published yet (Pujalte et al., 2016). Nevertheless, unpublished data from stable isotopes in the Carriata section show the PETM excursion, particularly for δ18O (Rosales et al., in prep.). The importance of the PETM lies in its major ecological consequences. In the oceans, deep-sea benthic foraminifera experienced their greatest extinction during the last 75 Million years (Thomas, 1990; Thomas and Shackleton, 1996), planktonic foraminifera, and calcareous nannoplankton experienced transient diversifications at the onset of the PETM (Kelly et al., 1996; Gibbs et al., 2006), and the correlation of the PETM with a major larger foraminifera turnover (LFT), between SBZ4 and SBZ5 (shallow benthic zones; Serra-Kiel et al., 1998), characterized by the first appearance of lenticular nummulites and true Alveolina is widely acknowledged (Orue-Etxebarria et al., 2001; Pujalte et al., 2003, 2009; Scheibner et al., 2005; Scheibner and Speijer, 2009; Zamagni et al., 2012; Drobne et al., 2014). On land, archaic mammals were replaced by modern groups (Clyde and Gingerich, 1998; Bowen et al., 2002; Gingerich, 2003; Wing et al., 2005; Secord et al., 2012) and the floras experienced important changes (Jaramillo et al., 2006). The record of the PETM, its duration, cause(s), and effects have been analyzed around the world using different methodologies (paleontological, sedimentological, and geochemical). The duration of the PETM has been investigated mainly to quantify the mass of carbon released to deduce the origin of the light carbon released into the atmosphere. The effort to quantify the duration with orbitally tuned sections is discussed in Röhl et al. (2003, 2007), Aziz et al. (2008), and Charles et al. (2011) and using extraterrestrial 3He fluxes in Farley and Eltgroth (2003) and Murphy et al. (2010). The onset of PETM has been analyzed with extracted marine sediments because of the Ocean Drilling Program (IODP now) and on inland sections (marine and terrestrial rocks) (McInerney and Wing, 2011 and references therein). In sea sediments, the onset of PETM coincides with the sharp and negative carbonate isotopic excursion (CIE) on clays (core layer) due to decalcification after the massive carbonate dissolution (Röhl et al., 2007). These authors suggest that the total duration of the PETM is 170 kyr, as the duration of the core layer is 5 precession cycles and the duration of the recovery of the carbon isotopic excursion until the carbon isotope values return to background value is about 3.5 precession cycles. Other studies suggest that the PETM spans up to 236 kyr (Charles et al., 2011), whereas McInerney and Wing (2011) estimate the duration of the PETM to be between 170 and 220 kyr (8–23 kyr correspond to the onset event, 115 kyr to the core event, and 50–85 kyr to the recovery event). In terrestrial sediments of the Bighorn Basin (USA), the beginning of the PETM is characterized by two distinct release events of carbon, separated by a recovery to background values, with a rate of carbon release more similar to present-day anthropogenic emissions (Bowen et al., 2015 and references therein). Models of heat transfer in marine sediments explain the long duration of the PETM suggest a slow and long-lasting release of light carbon due to a bottom water temperature anomaly (Zeebe, 2013). Different hypotheses have been proposed to link the injection of light carbon to the warming PETM event (see references in Kopp et al., 2009). An accelerated hydrogeological cycle is one of the effects of the warming event that determines changes in the sedimentation pattern in continental margins (USA) (Gibson et al., 2000; Villasante-Marcos et al., 2009 and references therein) and in fluvial environments (Colorado, USA; Foreman et al., 2012) or extreme precipitations from megafan in a braid plane in the Pyrenees (Schmitz and Pujalte, 2007). This change in the sedimentation pattern is reported from more intense chemical weathering on the continents and an increased siliciclastic input on marine environments due to an acceleration of the hydrological and weathering cycles (e.g., Kelly et al., 2005; Dickens, 2008; Pujalte et al., 2016) together with a drop in redox conditions (Villasante-Marcos et al., 2009). Regarding the rock magnetic properties/magnetic properties of rocks, an early controversy emerged from the North Atlantic continental margin in terms of the origin of the magnetic minerals found at the PETM. At first, some authors favored a comet impact (Kent et al., 2003; Cramer and Kent, 2005), but, later on, a biogenic origin of the magnetic minerals (magnetotactic bacteria) explained the special magnetic properties (Lippert et al., 2004; Kopp et al., 2007; Lippert and Zachos, 2007). Villasante-Marcos et al. (2009) analyzed the paleomagnetic signal of uplifted sections of the marine upper slope to an outer shelf in New Zealand, where the biogenic origin of the magnetic properties of the PETM was not found. However, the determination of the magnetic properties of such an interval (Dee Marls Fm) suggests an increase in the terrigenous supply. Another characteristic of the PETM and the Earth's magnetic field is that a short-lived reversal of the magnetic field during the PETM was found in an ocean drill core that was related to other paleomagnetic records of continental rocks in the Bighorn Basin and in ocean drill cores in the southern and northern Atlantic (Lee and Kodama, 2009 and references therein). Notwithsanding a possible anomaly in the paleomagnetic record, these authors suggest a possible coupling between Earth's core magnetofluid dynamo sphere and the atmosphere-hydrosphere during an abrupt catastrophic climate event. The goal of this paper is to provide new classical paleomagnetic data from shallow platform marine sediments of the PETM interval in the Southern Pyrenees. The PETM sediments underwent the deformation processes and the cleavage developments during the alpine deformation. The discussion focused on the magnetic signal and the effects of the deformation on the primary magnetic mineralogy was affected by the hydrological and redox changes during the PETM. 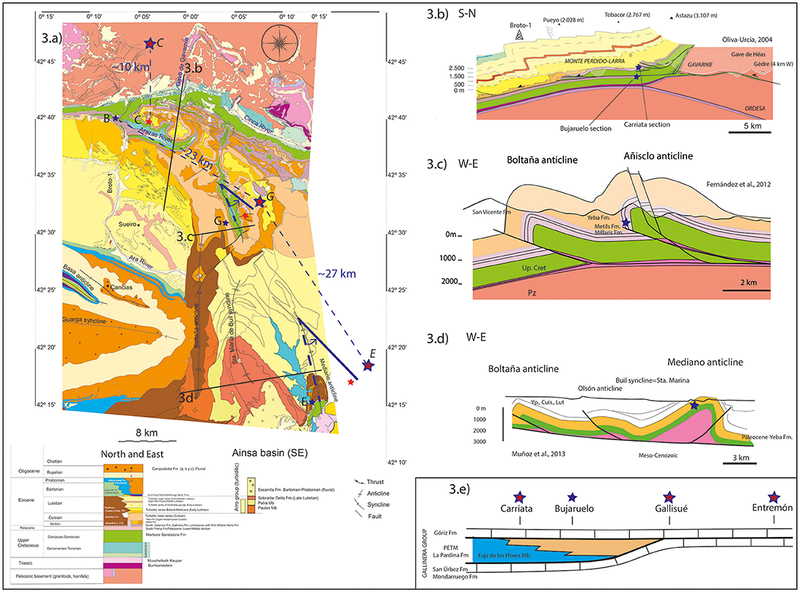 This work is based on stratigraphic observations and magnetic analysis of four sections located in the Southern Pyrenees: Carriata and Bujaruelo sections in the North, Gallisué to the South, and Entremón is the southernmost section (Figure 1A). Figure 1. (A) Present-day location of the studied section (red stars) in the geological map (modified from Choukroune and Séguret, 1973) where the regional cleavage planes are marked with short blue lines. (B) The PETM general stratigraphy modified from Barnolas and Gil-Peña (2001), Robador et al. (2010), and Pujalte et al. (2016). Epoch, Age, Geomagnetic Polarity Time Scale (GPTS), C: chrons, and SBZ: Shallow Benthic Zones (SBZ) (Serra-Kiel et al., 1998). Brown colors represent limestones; blue and white colors represent turbiditic deposits. Formation names and litostratigraphic units are represented. All sections were deposited in and/or near a shallow marine platform environment in the southern side of the E-W marine gulf opening to the Bay of Biscay (Plaziat, 1981; Baceta et al., 2011). Reconstructions of the South Pyrenean Basin during the early Paleogene can be found in Baceta et al. (2004), Robador (2008), Pujalte et al. (2016) studies. The deposition of the Paleogene in this South Pyrenean Basin is conditioned by the coeval formation of tectonic structures in the area with the activity of La Foradada fault (Ilerdian-Cuisian = Ypresian, possibly beginning in the Paleocene) and in the eastern part of the studied area with the activity of the Montsec thrust (Paleocene-Cuisian) (Fernández et al., 2012). To the north of the studied area, the activity of the Gavarnie and Millares thrusts has been described during Paleocene-Eocene times (Martinez-Peña and Casas-Sainz, 2003) and to the northeast, the Cotiella and Nogueres thrusts (Vergés et al., 2002; Beamud et al., 2011). Toward the northwest, the Lakora-Eaux-Chaudes was also active (Teixell, 1996; Labaume et al., 2016). However, the relative tectonic quiescence during the early Paleogene in the studied area contrasts with the highly tectonically active Eocene epoch in the west central part of the Pyrenees (Teixell, 1996; Barnolas and Gil-Peña, 2001; Fernández et al., 2012; Muñoz et al., 2013). A general transgressive stepwise sequence starts in the South-Pyrenean Basin in the Paleocene until the end of the Ilerdian with shallow platform deposits (Puigdefàbregas and Souquet, 1986; Barnolas and Gil-Peña, 2001). An intermediate regression step represented by siliciclastic facies in the northern sections at the beginning of the Ilerdian is interpreted as a braid delta system, fed by river(s) draining the Ebro Massif, which is named La Pardina Fm (Robador et al., 2009; Pujalte et al., 2016) (Figure 1B). In the southern studied sections, there is no record of La Pardina Fm (Robador et al., 2009; Pujalte et al., 2016) indicating that the coast retreated northwards, leaving the southern areas emerged for few hundreds of kyr <140–220 kyr according to Pujalte et al. (2016). Subsequently, the study area became submerged by the accumulation of shallow platform sediments (Van de Velde, 1967; Van Lunsen, 1970; Barnolas and Gil-Peña, 2001). The inversion of the South Pyrenean Basin occurs with the formation of the Pyrenees. The Pyrenees is a WNW-ESE asymmetric mountain range with a mainly southward vergence constituted by thrust sheets involving basement rocks and Mesozoic-Cenozoic cover units (Séguret, 1972; Muñoz, 1992). The formation of the Pyrenees has existed since Late Cretaceous to Miocene times (Roest and Srivastava, 1991). The Range shows a maximum shortening of 147 km at its central eastern part, ~75% of which is related to the stacking of the basement thrust sheets (Muñoz, 1992). Cleavage developed during the Pyrenean deformation with an estimated related shortening between 15 and 30% (Holl and Anastasio, 1995). This deformation has to be taken into account for a proper reconstruction of the studied sections location during the PETM. The deformation of the sections decreases from north to south. 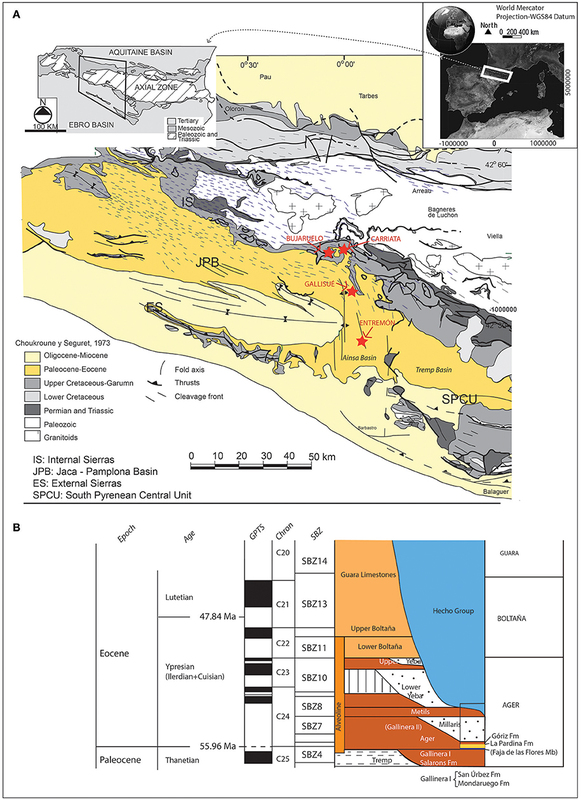 The Carriata and Bujaruelo sections are located in the Internal Sierras, a WNW-ESE high relief area involving Upper Cretaceous and Paleogene marine rocks (Figure 2). The Internal Sierras are affected by the south-vergent Larra-Monte Perdido thrust and fold system developed from middle Lutetian to Bartonian times, an imbricated thrust system affecting cover rocks (e.g. Teixell, 1996) (Figure 3). Although Carriata and Bujaruelo sections are separated by <5 km today, as it can be seen in Figures 3a,b, they are located in the hanging wall and footwall of a thrust related to the Larra-Monte Perdido thrust and fold system, respectively. The displacement of this thrust has been estimated to around ~10 km (Teixell, 1996; Oliva-Urcia, 2004) (Figure 3). Figure 2. Pictures showing the Gallinera Gp, the PETM of La Pardina Fm, and the Faja de las Flores Mb, (A) Panoramic view of Carriata section, (B) detail of Faja de las Flores Mb, (C) panoramic view of Bujaruelo section, and (D) details of sampling site with cleavage and bedding planes. Figure 3. Location of samples with more detail in (a) map view and cross-sections (b), (c) and (d). Shortening related to thrust and fold systems is ~10 km in the North, but <2 km for the E-W structures. Red stars locate the sections after restoration of the rotation (in case of the anticlines an anticlockwise rotation of 30° has been performed). Red stars with blue rim are locations of sections after individual rotation restoration and ~3 km of shortening restoration due to folding. The Bujaruelo section is the one with relative fixed position. C: Carriata, B: Bujaruelo, G: Gallisué, E: Entremón (in italics, the individually restored position of the sections). (e) Relative locations at the PETM time, adapted after Pujalte et al. (2016) and Robador et al. (2009) (in blue: prodelta sediments, in yellow: deltaic front). The Gallisué and Entremón sections are located in the Ainsa oblique zone (Muñoz et al., 2013), at present 14 and 39 km to the south, respectively, from the Carriata and Bujaruelo profiles (Figure 1). The Ainsa oblique zone represents a thrust and fold system characterized at surface by several north-south kilometer-scale folds. The Gallisué and Entremón sections are located on the western limbs of two of these folds, the Añisclo and Mediano anticlines, respectively (Figures 1, 3, 4). During the Middle-Late Eocene, structures of the Ainsa oblique zone developed and underwent clockwise vertical axis rotation of more than 50° (Mochales et al., 2012; Muñoz et al., 2013 and references therein). The rotation recorded in the western limb of the Mediano anticline is ~30° (Bentham, 1992) and similar values are found in the Añisclo anticline (compilation in Muñoz et al., 2013). The pivot point for these clockwise rotations is located at the northwestern end of each lateral ramp they are related to (as suggested in Muñoz et al., 2013). However, in W-E cross-sections (Figure 3c, simplified from Fernández et al., 2012), it can be observed that the shortening due to the anticline development is small, the Gallisué section was <3 km to the east (not taking into account the clockwise rotation) before the detachment and associated folding took place. Similarly, the shortening due to the Mediano fold is <3 km (Figure 3d), simplified from Muñoz et al. (2013). The clockwise rotations imply that originally the Gallisué and Entremón sections were located further to the NE (Figure 3a), purple stars with blue rim, after simple restoration of individual structures. Figure 4. (a) Panoramic view of the Eocene western limb of the Añisclo anticline, (b) the transition of the Paleocene to the Eocene (Thanetian-Ilerdian) masked by karstification, (c) a sampled site with two pressure solution family planes (E0: pressure solution planes parallel to bedding planes; E1: pressure solution planes related to the alpine deformation, tilt to the east in this outcrop), and (d) Photograph of the western limb of the Mediano anticline showing the sampled rocks of the Entremón section. The dam of the Mediano reservoir appears on the left. All sections were deposited in a more or less relatively tectonic quiescence and were later incorporated into the Pyrenean proto-chain during Lutetian to Bartonian times (e.g., Teixell, 1992, 1996; Poblet et al., 1998; Muñoz et al., 2013). The cleavage developed during the alpine deformation revealed the internal deformation, the paleotemperatures, and the tectonic load under which the pressure solution cleavage during the Pyrean orogeny occurred. The dominant cleavage is axial planar to folds at different scales in the studied area. The cleavage development is mainly related to the Gavarnie thrust emplacement and affects Paleozoic, Triassic, Upper Cretaceous, Paleocene, and the lower part of the turbiditic sequence of the Eocene Hecho Group in the studied area (Choukroune et al., 1968; Labaume et al., 1985; Teixell, 1992; Holl and Anastasio, 1995; Rodríguez Méndez, 2011; Izquierdo-Llavall et al., 2013). The analyses of 56 samples were carried out using petrographic and microthermometric analyses of fluid inclusions in extensional veins. The X-ray diffraction on clay mineral assemblages and the optical analysis (with vitrinite reflectance analysis) on organic matter dispersed in the sedimentary succession allowed to deduce paleotemperatures of 140–160° up to 215°C, which required a minimum burial for cleavage development of ~4km in the Internal Sierras (Izquierdo-Llavall et al., 2013). The development of cleavage was at first identified as a possible mechanism for a regional remagnetization found in the Internal Sierras, which postdates folding and tilting linked to the Gavarnie emplacement (Oliva-Urcia and Pueyo, 2007; Oliva-Urcia et al., 2008). 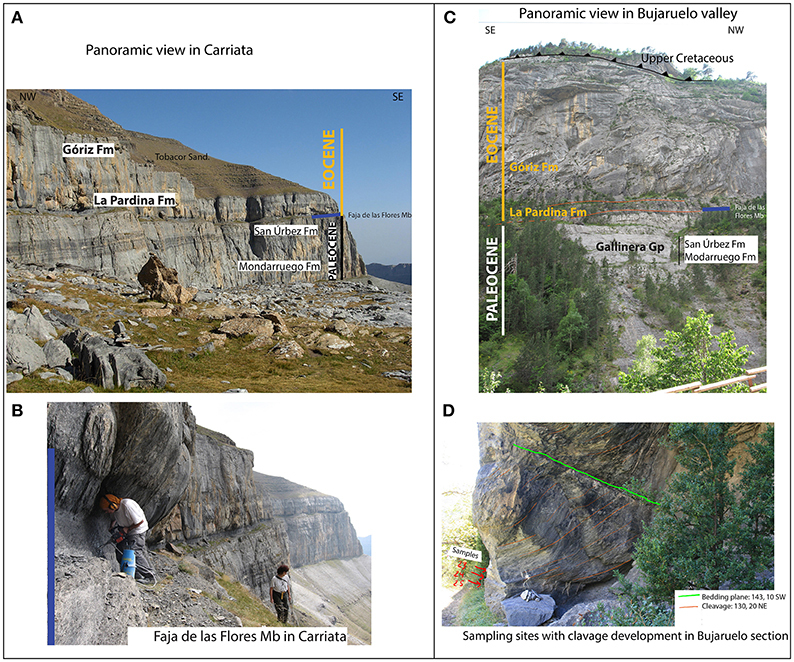 In addition, detailed investigations in the area revealed that the presence of a previous diachronic remagnetization event that predates the tilting of the Gavarnie thrust (Izquierdo-Llavall et al., 2015). The Carriata, Bujaruelo, and Gallisué sections analyzed in this study are located within the regional cleavage development area, which also corresponds to the remagnetized rock area (Figures 1, 2D). The regional knowledge of the PETM in the sampled sections has prompted their magnetic characterization in order to detect a diagnostic and preserved magnetic signal of that event despite subsequent diagenetic and deformational processes. Thus, four sections have been studied. The Paleocene-Eocene in the Southwest central Pyrenees is characterized by the following carbonatic rocks: marls, dolostones, limestones, sandy limestones, and marly limestones. Stratigraphic field observations are complemented with bibliographic definitions of SBZ and recent updates of names of Formations (Fm). As explained by Pujalte et al. (2016), the Gallinera Fm of Van de Velde (1967) is now considered the Gallinera Group, comprising the Fms of Mondarruego (limestones), San Úrbez (sandy limestones), Pardina (siliciclastic), and Góriz (limestones) (Robador et al., 2010). 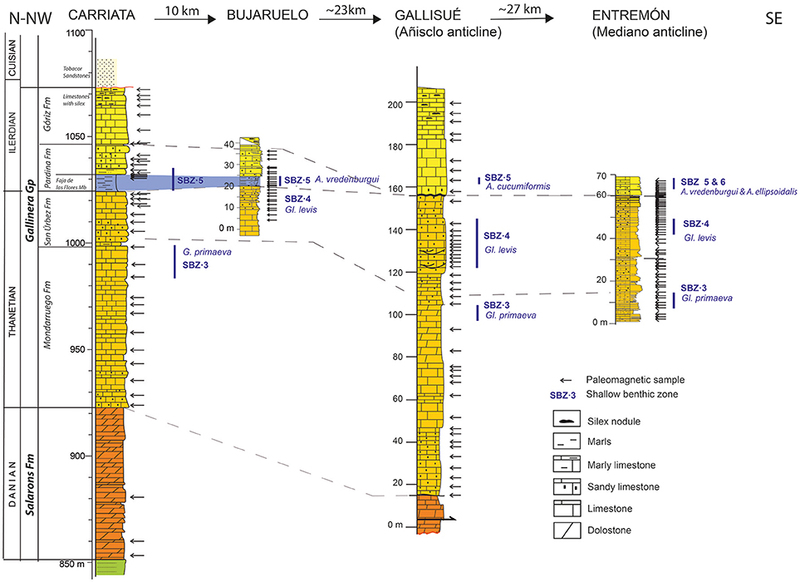 In the Carriata section, three levels were sampled from the Salarons Fm (dolostones) and the rest of the samples were taken from Mondarruego, San Úrbez, La Pardina, and Góriz Fms in ~130 m of section (Figure 5, Table 1). In Bujaruelo section, samples were taken from San Úrbez and La Pardina Fms for ~40 m, 17 m of which are from the siliciclastic part of La Pardina Fm (Figure 5, Table 1). 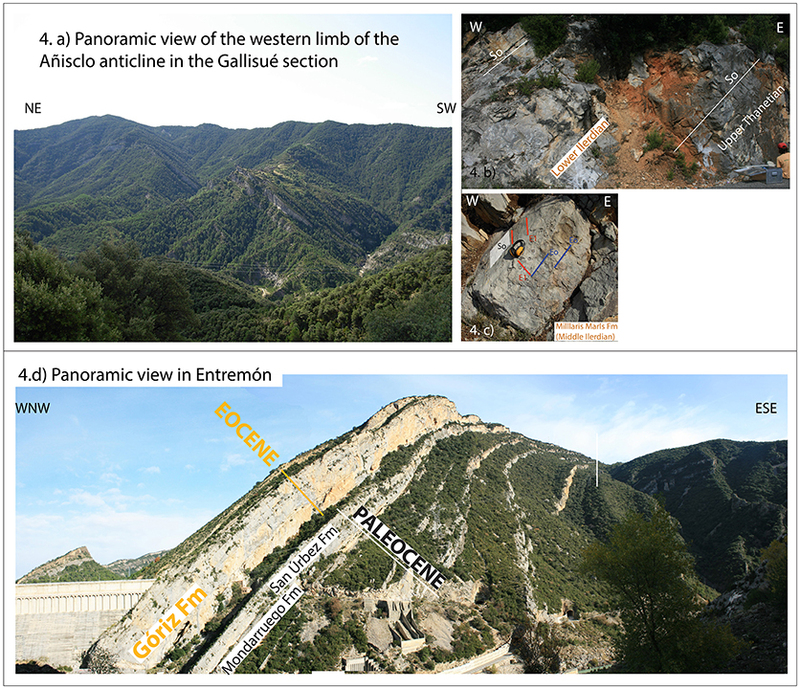 In the Gallisué section, samples were taken from the Mondarruego (~90 m), San Úrbez (~50 m), and La Pardina (~42 m) Fms. The Faja de las Flores Mb is not present (Figure 5, Table 1). In the Entremón section (named Mediano section in Pujalte et al., 2016), sampling was performed for ~70 m in the upper part of the Mondarruego, San Úrbez, and La Pardina Fms (Figure 5, Table 1). Figure 5. The four sections located from N-NW to SW with distances between each section after simple deformation reconstruction. Age represented on the left. For each column and from left to right, the following are shown: Stratigraphy (Fm names), representation of lithology and age, sampling distances (marked by arrows), and SBZ. The blue thick bar points to the Faja de las Flores Mb (Robador et al., 2010; Pujalte et al., 2016). Table 1. Averages for the paleomagnetic component calculated in each section. Paleomagnetic samples of standard size were drilled with a gasoline-powered portable water-cooled drill machine. Each section has 88, 54, 47, and 152 samples from Carriata, Bujaruelo, Gallisué, and Entremón sections, respectively. Sampling space varies from 0.5 to 8 m.
The rock magnetic measurements comprise the following: bulk magnetic susceptibility (χ), natural remanent magnetization (NRM), anhysteretic remanent magnetization (ARM), saturation of isothermal remanent magnetization (SIRM), and coercivity of remanence (Hcr). The DC field imposed over 100 mT alternating field (AF) demagnetization of the ARM was 50 μT in the ARM Magnetizer (2G Entrerprises). The maximum applied field for the SIRM varies from 0.5 to 1.8 T, applied with a pulse demagnetizer. The Hcr was calculated after the saturation of the sample at 0.5 T or 1.8 T. All measurements were performed at room temperature and normalized by mass. The coercivity of the remanence was calculated after applying the maximum field to the standard samples and then applying a magnetic field with increasing steps on the contrary sense or with powered samples in a magnetic measurements variable field translation balance (MMVFTB) as explained later. The variations of the bulk susceptibility, ARM, and SIRM are presented. The ARM reflects the concentration of low coercivity minerals (magnetite or ferromagnetic iron sulfides). The SIRM at high fields reflects the concentration of the antiferromagnetic minerals (minerals with high coercivity: hematites, goethite) plus the ferromagnetic minerals (Oldfield, 1991; Hunt et al., 1995; Ortega et al., 2006; Wang et al., 2010). The SIRM/ARM ratio, on the other hand, reveals the magnetic grain size variations in the section when a single magnetic mineralogy is present (Peters and Dekkers, 2003). For paleomagnetic analyses, most specimens were subjected to stepwise AF demagnetization procedures. Some sister samples also were stepwise thermally (TH) demagnetized. A total of 315 standard size paleomagnetic samples were analyzed. In addition, to perform the fold test at regional scale, discrete standard paleomagnetic samples were taken in the Añisclo anticline to the east and west of the Gallisué section in the Upper Cretaceous and Eocene rocks, respectively. Acquisition curves of isothermal remanent magnetization (IRM) (Dunlop, 1972) were also performed in some representative samples. The rock magnetic and paleomagnetic measurements have been performed in different laboratories: Paleomagnetic Laboratory of Burgos University and the Paleomagnetic Laboratory of Barcelona (CCiTUB -CSIC) in Spain, Kochi Core Center (Kochi University/JAMSTEC, Japan), and New Mexico University (Albuquerque, USA) using cryogenic magnetometers (2G Enterprises, Mountain View, CA, USA) with AF coils for the alternating field demagnetizations and zero fields ovens for the thermal demagnetization (every 50 to 25°C in ovens: Model TSD-1 Thermal Specimen Demagnetize—Schonstedt Instument Co. and MMTD—Magnetic Measurements Ltd., Aughton, UK) and every 5–20 mT steps in the AF coils. The characteristic components were calculated using the principal component analyses (PCA) (Kirschvink, 1980) with the VPD software (Ramón et al., 2017) and Remasof (Chadima and Hrouda, 2007). Fold tests were performed to determine the relative age of a characteristic component with respect to folding, at profile and regional scale using the IAPD-32 program (T. Torsvik et al., Software IAPD-32, 1996), which follows criteria from McElhinny (1964) and software from McFadden (1990). Bulk magnetic susceptibility (χ) was measured in a KLY-3S Kappabridge (working at 300 A/m and 875 Hz, AGICO Inc., Czech Republic) at the University of Zaragoza (Spain). Twenty selected samples were powdered to analyze their magnetic mineralogy. A MMVFTB (Petersen Instruments Mag-Instruments UG—Munich, Germany—) was used to measure the thermomagnetic curves (measuring variations of the induced magnetization between room temperature and 700°C in an applied field of 38 mT). The carbonatic rocks studied in the Carriata section start with the Paleocene rocks overlying the Maastrichtian (Upper Cretaceous), which consists of ~70 m of dolostones, limestones, and dolomitic limestones with algae laminations and scarce fossil content, which are known as Salarons dolostones Fm (Van de Velde, 1967). Its lower boundary is an abrupt lithological change with the siliciclastic deposits of the Maastrichtian Marboré Sandstones Fm. On top of the Salarons Fm, the Gallinera Gp is about 150 m. As explained by Pujalte et al. (2016), the Gallinera Fm of Van de Velde (1967) is now considered the Gallinera Group, comprising the Fms of Mondarruego (limestones), San Úrbez (sandy limestones), Pardina (siliciclastic), and Góriz (limestones) (Robador et al., 2010) shown in Figure 5. The Mondarruego Fm in the Carriata section is ~75 m thick; it begins with 10 m of sandy limestones with discocyclines, nummulites, operculiniforms, and local corals. The upper part of the Mondarruego Fm in this section contains benthic foraminifera: Glomalveolina primaeva, characteristic of SBZ3 (Serra-Kiel et al., 1998), of Lower-Middle Thanetian age. Overlying the Mondarruego Fm, there is San Úrbez Fm, which starts with ~10 m of sandy limestones and sandstones with tractive structures. In the upper part of the San Úrbez Fm, there are limestones rich in macroforaminifera (Ranikothalia) assigned to SBZ4 and attributed to the Upper Thanetian. In sharp contact overlying Thanetian limestones, 10 m of black marls crop out (the Faja de las Flores Member –Mb–), with a limolite-sandy level on top. They contain large foraminifera and have been related to the PETM (Pujalte et al., 2016). Overlying them, 18 m of sandy and marly limestones evolve to limestones rich in alveolinids, both the Faja de las Flores Mb together with the 18 m of sandy limestones fm La Pardina Fm. The faunal content of this unit has been assigned to the lower Ilerdian SBZ5 and SBZ6 (A. cucumiformis biozone). The section ends with 10 m of well-bedded limestones that are rich in chert nodules of the Góriz Fm. Regionally, brown marls and marly limestones of the Millaris Fm, attributed to the Middle Ilerdian, overlie the Góriz Fm with a sharp contact, but in this section, the Millaris Fm has been eroded by the Tobacor Sandstone Fm (Hecho Group turbidites, Bolave Mondiciero type, Ríos et al., 1982). In Bujaruelo section, limestones and sandly limestones were sampled (San Úrbez and La Pardina Fms). In the lower part of the San Úrbez Fm, macroforaminifera related to SBZ4 were distinguished in the field (Glomalveolina levis). In this section, the Faja de las Flores Mb is ~5 m thick and shows a pervasive cleavage development as in the Carriata section (Figures 2B,D), Alveolina bredenburgui was identified in the Faja de las Flores Mb (SBZ5, Serra-Kiel et al., 1998). In the Gallisué section, samples were taken from the Mondarruego (~90 m), San Úrbez (~50 m) and La Pardina (~42 m) Fms. The Faja de las Flores Mb is not present. Glomalveolina primaeva (SBZ3, Serra-Kiel et al., 1998) was identified at the top of the Mondarruego Fm. Glovalveolina levis is present in the San Úrbez Fm. The lower part of the Mondarruego Fm are sandy limestones which undergo transition to bioclastic limestones with corals located at ~45 m from the base of the section. Dolostones are found in the upper part of the Mondarruego Fm. The San Úrbez Fm is mostly represented by sandy limestones and dolostones with parallel and cross bedding. The boundary between the Paleocene-Ilerdian was karstified (see Figure 4B). The Góriz Fm is formed by limestones and limestones with chert nodules at the top. Cleavage due to pressure solution parallel and perpendicular to bedding is found in the whole section, particularly in the fine-grained rocks. In the Entremón section, limestones from the Mondarruego Fm, sandy limestones from the San Úrbez, and La Pardina Fms were sampled. However, the Faja de las Flores Mb is not present, as it occurs in the Gallisué section. The Paleocene-Ilerdian boundary is sharp and marked by a thin layer of abiotic gray marls (~30 cm) located at 60 m from the base of the section (Figure 5). Some intervals within the limestones and sandy limestones show red-brownish color. These intervals also correspond to the presence of Microcodium due to low sea level (Pujalte et al., 2016). The thermomagnetic curves inform about the type of magnetic mineral present in the samples since every mineral has a diagnostic temperature over which the ferromagnetic behavior changes to paramagnetic (Curie or Néel temperature, Dunlop and Özdemir, 1997 and references therein). The selected samples show irreversible thermomagnetic curves. The heating produces a generation of magnetite in all analyzed samples (see the increase of the magnetization during heating after 450°C). This behavior is observed in the Faja de las Flores Mb, La Pardina Fm (EN201), and Góriz Fm (GA208. EN142c) samples (Figure 6a). The presence of magnetite is recognized by the main decay of the induced magnetization at 580°C (Curie temperature of magnetite). The heating curves do not completely flatten after 580°C (except for the Bujaruelo sample), suggesting the presence of high coercivity minerals. This creation of new magnetite during heating is found in, for example, samples where iron contained in the biotite transforms to the ferromagnetic in magnetite during heating (Trindade et al., 2001). In addition, iron oxides can be formed from other minerals such as iron sulfides (pyrite, pyrrhotite, greigite, and troilite), carbonates (siderite and ankerite), silicates, and other iron oxides or hydroxides (e.g., Schwartz and Vaughan, 1972; Dekkers, 1990a,b). The small indentation in the cooling curves of Bujaruelo section (Faja de las Flores Mb) and in the abiotic gray marl of the Entremón section at about 300°C may suggest the presence of pyrrhotite (Curie temperature of ~325°C masked in the heating curve by the large peak of the secondary magnetite). However, the enlargement of the heating curve does not show any inflection around 325°C. 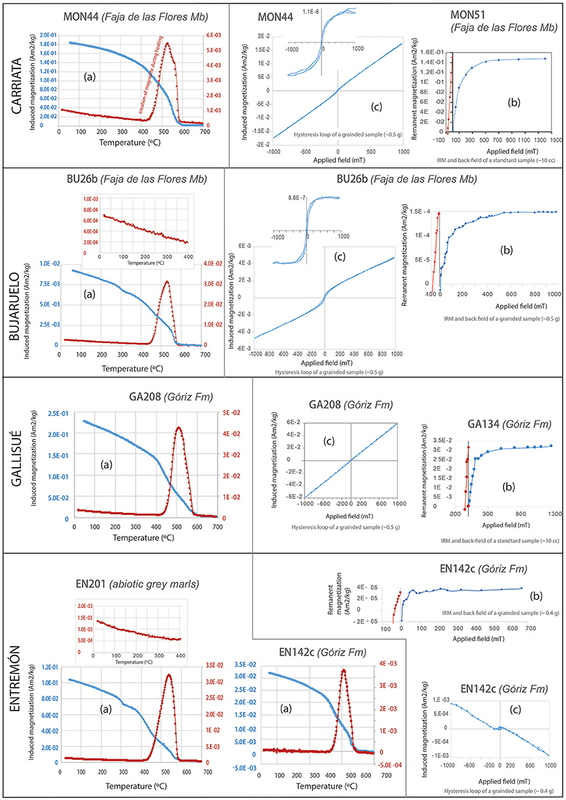 The acquisition of the IRM (Figure 6b) shows that the samples saturate above 0.6 T (except sample GA134), indicating the presence of a low coercivity mineral. The values of the coercivity of the remanence are below 70 mT except for few samples in the Gallisué section (Table 2C). Hysteresis loops performed in a MMVFTB reveal the presence of a low coercivity mineral even though the samples are weak and do not close at high fields (Figure 6c). Figure 6. (a) Curves of induced magnetization as a function of temperature (notice the different scale for the heating with respect to the cooling curves). The main decay of the heating run (red) at 580°C corresponds to the Curie temperature of magnetite. (b) Acquisition of the isothermal remanent magnetization (blue) and back-field (red) curves and (c) hysteresis loops (analyzed in a MMVFTB). MON: Carriata section, BU: Bujaruelo section, GA: Gallisué section, and EN: Entremón section. Table 2. Magnetic properties normalized by mass of the samples in the four sections. Thermal demagnetization diagrams are shown in Figure 7 and Supplementary Table 1. The decay of the remanence with temperature shows a main decay at 200–300°C except for MON4a, where the main decay of the remanence occurs at 100°C. Afterwards, the remanence increases and decreases again and becomes zero /or erratic between ~450°–500° and 600°C. Table 1 groups the characteristic with paleomagnetic components calculated between 300–325°C and 400–450°C or between 40 mT and 80 mT for each of the three northern sections. In Gallisué section, data were grouped along the section in 9 groups. The characteristic component is always the reverse in the three northern sections and it does not always direct toward the origin; therefore, it is anchoring to the line-fit without considering the origin of the diagram. In Entremón section, the magnetization is unstable and only a characteristic component between 140° or 250° and 460° or 540°C has been calculated in 6 samples (out of 31). The component does not have a common direction either in geographic or in tilt-corrected setting. Therefore, a robust average cannot be calculated. Figure 7. Examples of thermal demagnetization diagrams in stereographic and orthogonal projections and NRM decay during the stepwise demagnetization procedure. Open (closed) symbols represent down (up) directions, respectively. “MPE”: magnetic properties excursion, marked by blue (gray) bars in Figure 8 (Figure 9). A classical fold test is performed for the characteristic reverse component calculated in the three northern sections and an Upper Cretaceous site in Añisclo valley (Table 1). The fold test is negative and it reveals that the stable characteristic component is acquired after the beds were tilted during a period of reverse magnetic field (Figure 8). Figure 8. McElhinny's fold test for the characteristic component in the sampled rocks. Equal-area projections are before (BTC) and after (ATC) tectonic correction. The fold test is significant and negative. The CR (CR: critical value) depends on the number of samples and their vectorial sum. The test is positive when k>CR and maximum at 100% unfolding, and it is negative when k>CR and maximum at 0% unfolding of the bedding planes. Bulk magnetic susceptibility values normalized by mass (χ) range from 0.01 E-6 m3/kg to 1.2 E-6 m3/kg (Figures 9, 10, Tables 2A–D). The highest values occur in the Faja de las Flores Mb in the Carriata and Bujaruelo sections. In Entremón, the highest values of the magnetic susceptibility coincide with the abiotic marly interval of the onset of Ilerdian sedimentation. The negative values of the bulk magnetic susceptibility correspond to the predominance of diamagnetic behavior related to the predominance of calcite (diamagnetic mineral) and low content of paramagnetic (phyllosilicates) and ferromagnetic minerals (for example, magnetite). The saturation of Isothermal Remanent Magnetization at 0.5 T varies from 3.66 E-4 Am2/kg to 2 E-6 Am2/kg in Carriata section. A linear relationship between SIRM and ARM values is found in the three measured sections of Carriata, Bujaruelo, and Entremón (Figure 11), suggesting that an increase in concentration of ferromagnetic minerals relates to higher SIRM and ARM. 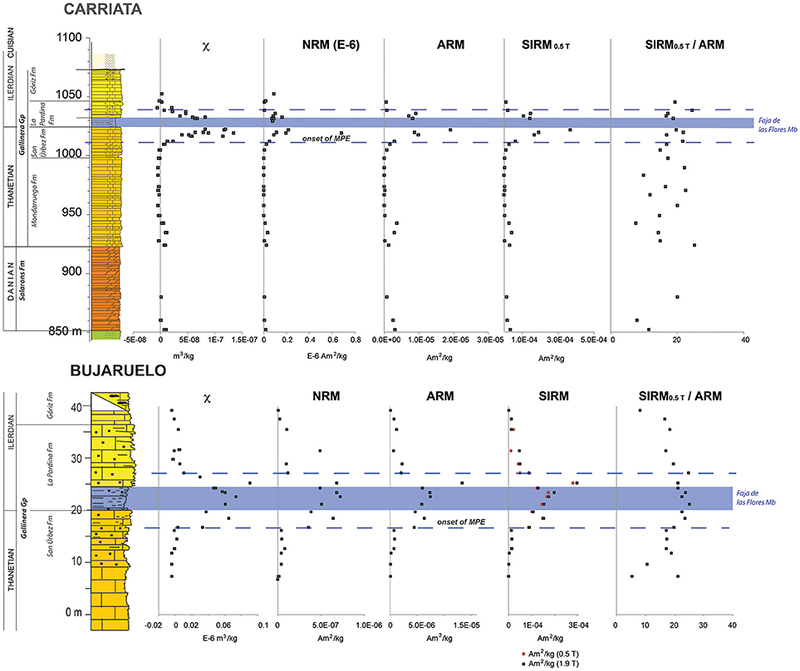 The highest value of ARM occurs in Carriata (1.91 E-5 Am2/kg) at the top of the San Úrbez Fm (Figure 9) and the lowest value is 4 E-9 Am2/kg. Different saturation fields for the SIRM analyses were applied in different sections. The saturation field of 0.5 T was applied to all sections. In addition, the Bujaruelo samples were subjected to 1.9 T field and the Entremón samples to 150 mT and 1.8 T fields. Figure 9. 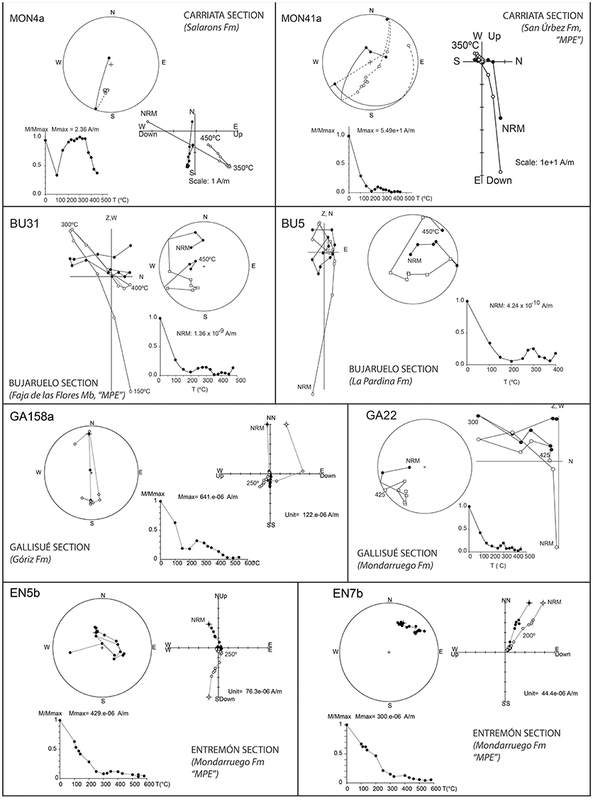 Magnetic signal in Carriata and Bujaruelo sections, bulk magnetic susceptibility, NRM, ARM, SIRM, and SIRM0.5T/ARM ratio. Discontinuous horizontal blue lines mark the positive “magnetic properties excursion” (MPE). The blue rectangle marks the Faja de las Flores Mb at the bottom of La Pardina Fm (following Pujalte et al., 2016). Vertical scale is variable. In the Bujaruelo section, the colors of the SIRM column represent two different applied fields: in red, 0.5 T and in gray, 1.9 T.
Figure 10. Magnetic signal in the Gallisué and the Entremón sections. In Gallisué, bulk magnetic susceptibility, NRM, SIRM0.5T, and coercivity of the remanence (mT). In Entremón, bulk magnetic susceptibility, NRM, ARM, SIRM, and SIRM0.5T/ARM ratio. The colors of the SIRM column represent three different applied fields: in red, 150 mT, in green, 0.5 T, and in gray, 1.8 T. Gray bar marks higher values of ARM and/or SIRM. In the Entremón section, the top gray bar corresponds to the abiotic marly interval. Vertical scale is variable. Figure 11. Biplot diagrams with magnetic values of NRM, bulk susceptibility, SIRM (at 0.5 T), and ARM, normalized by mass. The magnetic signal of the NRM, ARM, and SIRM of the two northern sections increases concomitantly with the magnetic susceptibility suggesting that the ferromagnetic content increases. The increase occurs before the onset of the PETM (Faja de las Flores Mb). In the Bujaruelo section, the SIRM was also applied using 0.5 T and 0.9 T fields. The similar values of the remanent magnetization for the two applied fields indicate that no high coercitive minerals (such as hematite or goethite, known as “hard” magnetic minerals) are present. In the southern sections, where La Pardina Fm (onset of PETM) is not present, the magnetic signal also varies, particularly in the Entremón section, where three peaks in the magnetic properties measured are visible: two in the Mondarruego Fm and one at the beginning of the Ilerdian, strictly related to an abiotic marly interval (gray bars in Figure 10). The magnetic signal in Gallisué relates to the low content of ferromagnetic (and paramagnetic) minerals in the carbonatic rocks, particularly seen in the abundance of negative values of the magnetic susceptibility. The coercivity of remanence values measured in this part of the section have an average of −66 mT with higher values in the gray bar (not shown in Figure 9), suggesting the presence of mineral with high coercivity in such interval. The magnetic signal in Entremón shows three “excursions” or higher values (positive excursions marked with gray bars in Figure 10). Looking at the SIRM column, the “excursion” of the upper part of the section shows similar values for the three SIRMs, therefore, indicating the presence of low coercivity minerals such as magnetite. However, in the two lower intervals or “excursions” with higher magnetic property values, the SIRM increases with increasing magnetic fields suggesting the presence of high coercivity minerals (hematite, goethite). The variation of the SIRM/ARM ratio in the three analyzed sections remains fairly constant. This ratio is related to the magnetic mineralogy grain size when the mineralogy remains constant (Peters and Dekkers, 2003), therefore, indicating that the magnetic signal increase at certain depths is not related to magnetic grain size variations, but to the ferromagnetic mineral concentration. The magnetic signal of rocks has been useful to determine the position of the PETM interval in lithologically more homogeneous sections in New Zealand (Villasante-Marcos et al., 2009). In the southwest-central Pyrenees, the marine sediments of the PETM record a large “excursion” in the magnetic properties during the PETM interval in Carriata and Bujaruelo sections. The “excursion” is localized around a marly interval (Faja de las Flores Mb) and neighboring limestones. The Faja de las Flores Mb has been interpreted as the prodelta sedimentation related to the climatic change of the PETM due to an intensification of the hydrological cycle with a previous lowering of the sea level (Pujalte et al., 2016 and references therein). The Paleocene-Eocene lithology in the SW Pyrenees is not as homogeneous as the lithology of New Zealand. However, it is noticeable that the increase of the bulk magnetic susceptibility values is up to two orders of magnitude of Faja de las Flores Mb in the two northern sections. In addition, the increase of the magnetic susceptibility (and the values of the other magnetic properties, Figure 9) predates the onset of the marly sediments. This indicates an increase in the content of ferromagnetic minerals prior to the lithological change linked to the onset of the PETM, and a subsequent decrease during the marly sediments. After the marly interval of Faja de las Flores Mb, limestones displayed unexpected (for their lithological type) higher magnetic values. Generally, marls and marly limestones show higher values of, magnetic susceptibility than limestones: standard bulk magnetic susceptibility is ~200 SI in marls and it can reach negative values in limestones due to the predominance of calcite as diamagnetic mineral (Borradaile and Jackson, 2004 and references therein). The SIRM/ARM ratio indicates the variation of magnetic grain size when magnetic mineralogy is homogeneous throughout the sampled section. The dispersion of the SIRM/ARM remains approximately consistent throughout the sections, suggesting a similar grain-size distribution. On the other hand, the good correlation of the curve of ARM and SIRM also suggests a uniform grain-size distribution of the low coercivity mineral (as also seen in Hirt et al., 2003). In addition, the concomintant increase in χ, ARM, and SIRM values during the PETM (“magnetic properties excursion”) indicates that the ferromagnetic content of the samples increases not only in the Faja de las Flores Mb (marly interval), but also in the neighboring limestones in the two northern sections (Carriata and Bujaruelo). Magnetite has low coercivity values (and it is typically referred as “soft”), and it would be saturated at low fields (typically, magnetite saturates below 0.5 T), whereas hematite or goethite have high coercivity values (“hard”) and they are not saturated by the maximum fields (of 1.9 T) applied in this study. The increase of the ferromagnetic content in the Bujaruelo section is related to magnetite since the values of SIRM at 0.5 T and 1.9 T magnetic fields give similar results. However, the presence of a positive magnetic signal excursion is not diagnostic of the PETM. In the southernmost sections (particularly in the Entremón section), there is no record of the PETM due to the regression of the ocean coast toward the North (Robador et al., 2009; Pujalte et al., 2016). Nevertheless, the magnetic signal increases at certain intervals. In the Entremón section, the peak of the magnetic signal coincides with an abiotic marly layer and it is strictly constrained to the marly interval (neighboring limetones show no excursion), which was expected due to change in lithology. Below, in the first 30 m of the section, there is a wide distribution of magnetic properties that are not observed in the northernmost sections. The increase in the SIRM values at increasing magnetic field values in the lower part of the Entremón section, particularly, in the magnetic excursions marked with gray bars in Figure 10, suggests the presence of high coercivity minerals in those intervals of sandy limestones. The origin of magnetite, detrital, diagenetic, or biogenetically induced cannot be deduced directly from the data presented here, but since La Pardina Fm is related to the expansion of a braid delta toward the North (Pujalte et al., 2016), it seems plausible to infer tentatively a detrital origin for the abundance of primary magnetite in the marly interval (Faja de las Flores Mb at the bottom of La Pardina Fm) with respect to the limestones of the carbonate platform. An abrupt increase in the discharge and sediment supply of rivers has been deduced in the Carriata/Bujaruelo sections area, since a 10 km progradation of the delta of La Pardina Fm has been inferred in the short time of the PETM duration (Pujalte et al., 2016). In addition, recent compilations suggest that at middle latitudes, the lithologic, or sedimentologic changes associated with the PETM hydrological perturbation were more dramatic (Pujalte et al., 2016 and references therein). However, the alpine deformation and the construction of the Pyrenean orogeny have produced remagnetization events recorded by magnetite. Remagnetizations have been described in the carbonatic materials of the Upper Cretaceous and part of the Eocene rocks (Oliva-Urcia and Pueyo, 2007; Oliva-Urcia et al., 2008; Izquierdo-Llavall et al., 2015). In addition, the new paleomagnetic data of the three northernmost sections also reveal the presence of the post-folding remagnetization component, confirming a secondary magnetite production during the pyrenean deformation. The tectonic-sedimentary load and the pressure solution cleavage development associated to that load during the Pyrenean deformation have facilitated the reorganization of the original magnetite and probably its new formation at different stages of the orogeny's evolution, since remagnetization events are recorded by magnetite (Oliva-Urcia et al., 2008; Izquierdo-Llavall et al., 2015). The cleavage development during the Pyrenean orogeny produces the dissolution of carbonatic material and the remobilization of those fluids, leaving the insoluble material (iron oxides among it) concentrated in microlithons (Holl and Anastasio, 1995; Oliva-Urcia et al., 2008). This pressure solution event explained, at first, the post-folding remagnetization found in the Upper Cretaceous (Oliva-Urcia et al., 2008). The same post-folding remagnetization is found in the analyzed materials around the PETM interval in the three northern sections of this study. According to Lacroix et al. (2014), the pressure-solution cleavage was associated with calcite-quartz shear and extension veins. The geochemistry analyses performed on those veins indicate that a local fluid-assisted mass transfer from the sediment to the veins does not necessitate large fluid flow. These apparently closed hydrological fluid flow systems in combination with the cleavage development may have produced the remobilization and the reorientation of the primary ferromagnetic minerals (Oliva-Urcia et al., 2008) and the new formation of the ferromagnetic minerals from the Faja de las Flores Mb to the adjacent rocks, as it has been deduced in the Upper Cretaceous rocks (Izquierdo-Llavall et al., 2015). This supposition would explain that the magnetic signal excursion is observed, not only constrained to the marly interval of the Faja de las Flores Mb, but also in the limestones neighboring the Faja de las Flores Mb, about 10 m in the Carriata section and <5 m in the Bujaruelo section, below the onset of the Faja de las Flores Mb and above the end of the Faja de las Flores Mb (Figures 9, 12). Figure 12. Sketch of the concentration of magnetite grains (profile on the right of every column). (A) After deposition of the Cenozoic rocks (primary) in gray and (B) after alpine deformation cleavage development due to pressure solution and remagnetization (due to reorientation and new formation of magnetite—secondary —) in red. The cleavage development affecting the three northernmost sections is mainly related to the Gavarnie basement thrust (Teixell, 1992). In addition, it has been calculated that the Carriata section has been transported toward the south at least 10 km more than the Bujaruelo section due to the Larra-Monte Perdido thrust system (see geological location above), which was active prior to the Gavarnie basement thrust (Teixell, 1992, 1996; Millán Garrido et al., 2006). In the southernmost section (Entremón), the excursion of the magnetic signal around the PETM interval is related to a “soft” coercivity mineral (magnetite), as increasing magnetic fields provide similar values of SIRMs (Figure 10) and it is strictly confined to the abiotic marly interval. This Entremón section is out of the cleavage front (Izquierdo-Llavall et al., 2013) and, therefore, neither pressure solution cleavage development nor closed hydrological fluid flow is occurring in the section during the Pyrenean deformation. The sedimentation in this section indicates low sea level interval and shallow marine environments during Mondarruego and San Úrbez Fms deposition. The magnetic excursions taking place in the Mondarruego and the San Úrbez Fms in sandy limestones intervals (gray bars in Figure 10) are most probably associated to the presence of other ferromagnetic minerals since the SIRM values at higher magnetic fields increase the magnetic signal. Therefore, high coercivity minerals (hematite and/or goethite) are possibly present, as it is also suggested by the thermomagnetic curves. These intervals may be associated with different oxidation conditions due to the low sea level and the occurrence of subaerial exposures on this part of the studied area during the PETM period. The PETM has been widely studied for the effects of the release of light carbon into the atmosphere and the rise of ocean (surficial and deep) and terrestrial temperatures. This is due to the similarities observed in the present worldwide rise of average temperatures (McInerney and Wing, 2011). Magnetic properties can be a proxy to detect past environmental changes. Increases in magnetic values (magnetic excursions) are observed in the four studied sections. In the two northern sections, these excursions are interpreted to be “derived” from the primary magnetic signal during the PETM. The primary magnetic signal in the SW Pyrenees produced higher magnetic signal in marls than in limestones in relation to the enhancement of the hydrological system during the PETM. This primary magnetic signal is modified during the alpine deformation (transformed to new formation/rotation of ferromagnetic minerals). Therefore, the derived enhanced magnetic signature of the PETM sediments (Faja de las Flores Mb) in the two northern sections is due to the Pyrenean deformation, which produces cleavage development and a close hydrological fluid flow system. In this situation, the Pyrenean deformation could produce an increase in the magnetite content of the neighboring rocks of the Faja de las Flores Mb as it is observed in the Carriata and Bujaruelo sections. In the southernmost section, the magnetic signature is related to the naturally higher content of magnetite in marls (the abiotic gray marl interval in Entremón section) than in limestones and most probably due to the presence of different magnetic mineralogies (soft and hard: magnetite and hematite) in the red-brownish limestones and sandy limestones due to different oxidation conditions when in low sea level/subaerial intervals. Nowadays, magnetic excursion found around the PETM interval in the SW Pyrenees is related to lithologically contrasted marls/limestones. 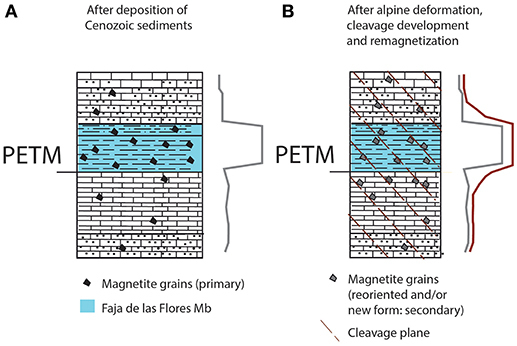 In the two northern sections, a modification of the ferromagnetic content in the neighboring limestones of the marly interval recording of the PETM is interpreted to be related to the Pyrenean deformation and cleavage development. All authors have contributed to sampling. Field work was carried out by BO-U, IG-P, RS and JMS. Analyses were performed by BO-U. Writing, figures, and tables were created by BO-U with revisions from the rest of the authors. Discussions about the structure, data display and content leading to the final manuscript were carried out by BO-U, IG-P, IR, RS and JMS. Thanks for the financial support from the Autonomous Organism of National Parks for the project 074/2006 (Principal Researcher A. Robador) and the Sobrarbe Geopark (now Sobrarbe-Pyrenees UNESCO World Geopark) for their financial support to the MAXTERMAG project. Reviewers are acknowledged for their detailed and helpful comments that contributed to improve the first version of the manuscript. Editor L. Jovane is acknowledged for helping in the handling of the manuscript. Baceta, J., Pujalte, V., Wright, V. P., and Schmitz, B. (2011). “Carbonate platform models, sea-level changes and extreme climatic events during the Paleocene-early Eocene greenhouse interval: a basin-platform-coastal plain transect across the southern Pyrenean basin,” in Pree-Meeting Field trips Guidebook, 28th IAS Meeting, eds C. Arenas, L. Pomar, and F. Colombo, (Zaragoza: Sociedad Geológica de España, Geo-Guías), Vol. 7, 151–198. Baceta, J. I., Pujalte, V., Serra-Kiel, J., Robador, A., and Orue-Etxebarria, X. (2004). “El Maastrichtiense final, Paleoceno e Ilerdiense inferior de la Cordillera Pirenaica,” in Geología de España Sociedad Geológica de España-Instituto Geológico y Minero de España, ed J. A. Vera (Madrid), 308–313. Barnolas, A., and Gil-Peña, I. (2001). Ejemplos de relleno sedimentario multiepisódico en una cuenca de antepaís fragmentada: La Cuenca Surpirenaica. Boletín Geol. Minero 112, 17–38. Bentham, P. A. (1992). The tectono-Stratigraphic Development of the Western Oblique Ramp of the South-Central Pyrenean Thrust System, Northern Spain. Ph.D. University of Southern California. Chadima, M., and Hrouda, F. (2007). Remasoft 3.0: Paleomagnetic Data Browser and Analyzer. Choukroune, P., Martinez, C., Seguret, M., and Mattauer, M. (1968). Sur L'extension, le Style et I'sge de Mise en place de la Nappe de Gavarnie (Pyrenees centrales). Compres Rendus de 1'Acad. des Sci. 260, 1360–1363. Choukroune, P., and Séguret, M. (1973). Carte Structurale des Pyrénées. ELF-ERAP. Mission France, Boussens. Clyde, W. C., and Gingerich, P. D. (1998). Mammalian community response to the latest Paleocene thermal maximum: an isotaphonomic study in the northern Bighorn Basin, Wyoming. Geology 26, 1011–1014. Dekkers, M. J. (1990b). Magnetic properties of natural goethite—III. Magnetic behaviour and properties of minerals originating from goethite dehydration during thermal demagnetisation. Geophys. J. Int. 103, 233–250. Dickens, G.R. (1999). Carbon cycle: the blast in the past. Nature 401:752. Drobne, K., JeŽ, J., Cosović, V., Ogorelec, B., Stenni, B., and Zakrevskaya, E. (2014). “Identification of the Palaeocene–Eocene Boundary based on larger foraminifers in deposits of the Palaeogene Adriatic Carbonate Platform, southwestern Slovenia,” in STRATI 2013 (Cham: Springer), 89–93. Dunlop, D. J., and Özdemir, Ö. (1997). Rock Magnetism, Fundamentals and Frontiers. Cambridge Studies in Paleomagnetism. (Cambridge, New York, NY: Cambridge Studies in Magnetism Series), xxi–573. Gingerich, P. D. (2003). “Mammalian responses to climate change at the Paleocene-Eocene boundary: Polecat Bench record in the northern Bighorn Basin,” in Special Papers, (Geological Society of America), 463–478. Lippert, P. C., Zachos, J., Bohaty, S., and Quattlebaum, T. (2004). Rock Magnetic Properties Across Paleocene-Eocene boundary Sediments from the North Atlantic, South Atlantic, and Eastern Pacific. AGU Fall Meeting Abstracts. Luterbacher, H., Hardenbol, J., and Schmitz, B. (2000). Decision of the voting members of the International Sub-commission on Paleogene Stratigraphy on the criterion for the recognition of the Paleocene/Eocene boundary. Newsl. Int. Subcomm. Paleogene Stratigr. 9:13. Millán Garrido, H., Oliva Urcia, B., and Pocoví Juan, A. (2006). La transversal de GavarnieGuara. Estructura y edad de los mantos de Gavarnie. Guara-Gèdre y Guarga (Pirineo centro-occidental). Geogaceta 40, 35–38. Muñoz, J. A. (1992). “Evolution of a continental collision belt: ECORS-Pyrenees crustal balanced cross-section,” in Thrust tectonics, ed K. R. McClay (Dordrecht: Springer), 235–246. Oliva-Urcia, B. (2004). Geometría y cinemática rotacional en las Sierras Interiores y Zona Axial (sector de Bielsa) a partir del análisis estructural y paleomagnético. Ph.D., Univeridad de Zaragoza. Pujalte, V., Orue-Etxebarria, X., Schmitz, B., Tosquella, J., Baceta, J. I., Payros, A., et al. (2003). 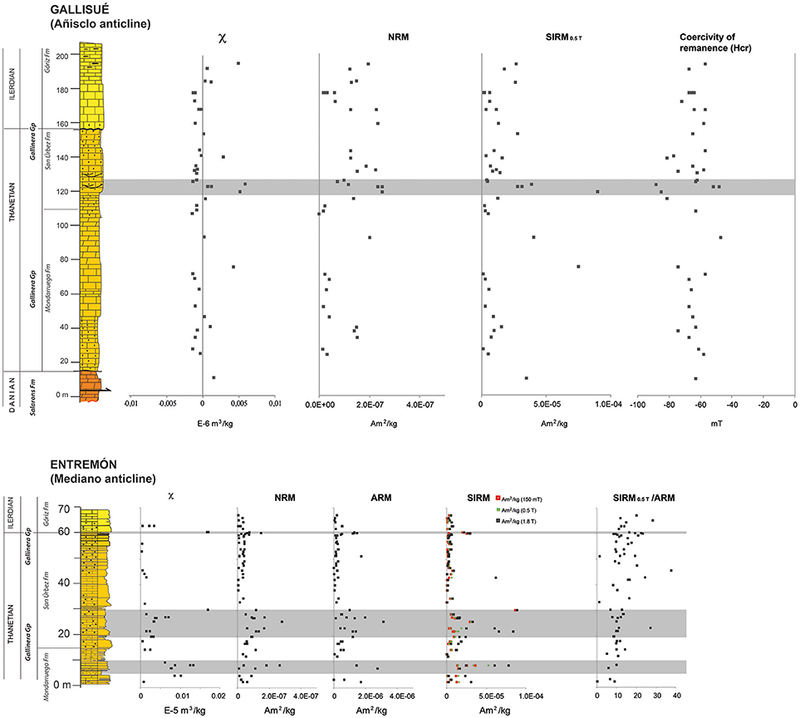 “Basal Ilerdian (earliest Eocene) turnover of larger foraminifera: age constraints based on calcareous plankton and 13C isotopic profiles from new southern Pyrenean sections (Spain). Causes and consequences of globally warm climates in the early Paleogene,” in Geological Society of America Special Paper (Geological Society of America), 205–221. Pujalte, V., Schmitz, B., Baceta, J. I., Orue-Etxebarria, X., Bernaola, G., Dinarès-Turell, J., et al. (2009). Correlation of the Thanetian-Ilerdian turnover of larger foraminifera and the Paleocene-Eocene thermal maximum: confirming evidence from the Campo area (Pyrenees, Spain). Geol. Acta 7, 161–175. Ramón, M. J., Pueyo, E. L., Oliva-Urcia, B., and Larrasoaña, J. C. (2017). Virtual directions in paleomagnetism: A global and rapid approach to evaluate the NRM components. Front. Earth Sci. 5:8. Ríos, L. M., Lanaja, J. M., and Frutos, E. (1982). Hoja geológica y memoria n° 178 (Broto) del Mapa Geológico de España 1:50.000, 2a ser. (MAGNA), 60 pp. I.G.M.E. Robador, A. (2008). El Paleoceno e Ilerdiense inferior del Pirineo occidental: Estratigrafía y Sedimentología. Ph.D., thesis University of the Basque Country, Spain. Publicaciones del Instituto Geológico y Minero de España, Serie Tesis Doctorales, 12, Madrid 312 pp. Robador, A., Pujalte, V., Samsó, J. M., and Payros, A. (2009). Registro geológico del máximo térmico del Paleoceno-Eoceno en el Parque Nacional de Ordesa y Monte Perdido (Pirineo Central). Geogaceta 46, 111–114. Robador, A., Sams,ó, J. M., Pujalte, V., Oliva, B., Gil, I., Soto, R., et al. (2010). “Cartografía geológica a escala 1: 25.000 del Parque nacional de Ordesa y Monte Perdido y su aplicación a la gestión e interpretación del medio natural del Parque Nacional,” in Proyectos de Investigación en Parques Nacionales 2006–2009, (Madrid: Organismo Autónomo de Parques Nacionales Madrid), 7–28. Rodríguez Méndez, L. (2011). Análisis de la Estructura Varisca y Alpina en la Transversal Sallent-Biescas. Pirineos centrales, Huesca. Roest, W. R., and Srivastava, S. P. (1991). Kinematics of the plate boundaries between Eurasia, Iberia, and Africa in the North Atlantic from the Late Cretaceous to the present. Geology 19, 613–616. Röhl, U., Norris, R. D., and Ogg, J. G. (2003). “Cyclostratigraphy of upper Paleocene and lower Eocene sediments at Blake Nose Site 1051 (western North Atlantic),” Causes and Consequences of Globally Warm Climates in the Early Paleogene, eds S. L. Wing, P. D. Gingerich, B. Schmitz, and E. Thomas (Boulder: Geological Society of America Special Paper), 576–589. Scheibner, C., and Speijer, R. P. (2009). Recalibration of the Tethyan shallow-benthic zonation across the Paleocene-Eocene boundary: the Egyptian record. Geol. Acta. 7, 195–214. Schwartz, E. J., and Vaughan, D. J. (1972). Magnetic phase relations of pyrrhotite. J. Geomagnetism Geoelect. 24, 441–458. Séguret, M. (1972). Etude des Nappes et series décollées de la partie central du versant sud des Pyrénées – Caractère synsédimentaire, role de la compression et de la gravité. USTELA, Montpellier. Serra-Kiel, J., Hottinger, L., Caus, E., Drobne, K., Ferrandez, C., Jauhri, A. K., et al. (1998). Larger foraminiferal biostratigraphy of the Tethyan Paleocene and Eocene. Bullet. Soc. Géol. France 169, 281–299. Teixell, A. (1992). Estructura alpina en la transversal de la terminación occidental de la Zona Axial Pirenaica. Tesis doctoral, Universitat de Barcelona. Thomas, E. (1990). Late Cretaceous through Neogene deep-sea benthic foraminifera (Maud Rise, Weddell Sea, Antarctica). Proc. Ocean Drill. Prog. Sci. Res. 113, 571–594. Thomas, E., and Shackleton, N. (1996). “The Paleocene–Eocene benthic foraminiferal extinction and stable isotope anomalies,” in Correlation of the Early Paleogene in Northwest Europe. Geological Society Special Publication, eds R. W. O. B. Knox, R. M. Corfield, and R. E. Dunay (The Geological Society Publishing House Unit Brassmill Enterprise Centre Brassmill), 401–441. Van de Velde, E. (1967). Geology of the Ordesa overthurst mass, Spanish Pyrenees, province of Huesca. Estudios Geol. 26, 163–201. Van Lunsen, H. A. (1970). Geology of the Ara-Cinca region, Spanish Pyrenees, province of Huesca: (with special reference to compartmentation of the Flysch basin). Doctoral dissertation, Utrecht University. Copyright © 2018 Oliva-Urcia, Gil-Peña, Samsó, Soto and Rosales. This is an open-access article distributed under the terms of the Creative Commons Attribution License (CC BY). The use, distribution or reproduction in other forums is permitted, provided the original author(s) and the copyright owner(s) are credited and that the original publication in this journal is cited, in accordance with accepted academic practice. No use, distribution or reproduction is permitted which does not comply with these terms.